Although it’s been making the rounds overseas, T-Mobile customers will soon be able to relish on the Sony Xperia Z very soon – a premium smartphone that’s unique for being water resistant. Normally, water resistant devices tend to have designs that are unflattering, which isn’t surprising at all. 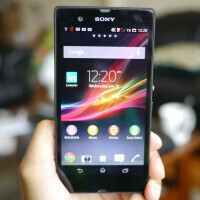 Breaking the trend, the Sony Xperia Z is sure to complement T-Mobile’s lineup nicely, as it’s the first time customers are seeing an Android phone crafted from Sony. Much like its contemporaries, the T-Mobile Sony Xperia Z has a massive and super detailed display that’s ready for the times. Specifically, it’s a 5-inch 1080p (1920 x 1080) HD Reality display with Sony’s Mobile BRAVIA 2 engine, which delivers amazing clarity depending on what you’re viewing on the phone. For example, if you’re watching a high-def movie, the display will automatically adjust its color saturation to provide you with the most optimal experience. When it comes to detail, there’s no arguing about how pixels are tightly mashed together to give everything that surreal level of sharpness. Conversely, outdoor viewing tends to be challenging due to the reflective glass that’s on top of the display. Frankly, this a gorgeous looking smartphone crafted from quality materials to show that water resistant phones can be stylish. Sporting some hard lines, it’s a little funky trying to hold the handset with our hands, mainly because of the sharp 90-degree angles of its bezel. Regardless of that, the construction is fantastic for a flagship device – even better knowing that this can survive a dip under water for an extended amount of time. And simply folks, that’s exactly what makes the Sony Xperia Z so fascinating! In fact, if you want to impress your friends, just inexplicably dunk the handset in your glass of water (no ice please) at a restaurant. Naturally, you’ll get some surprising looks from you friends, but better yet, the look of your server’s face is going to be priceless. Interestingly enough, there’s another advantage seen with the Sony Xperia Z, seeing that it’s sporting an Android experience that might seem alien to longtime T-Mobile customers. Running Sony’s custom UI on top of Android 4.1.2 Jelly Bean, the experience is nearly identical to what we’ve seen already with the international variant – save for a few T-Mobile centric widgets on the homescreen, and the usual set of apps from the carrier. Obviously, this is a totally new experience being presented to T-Mobile customers, but in the greater scheme of things, it’s still lagging behind the insane set of features found with Sammy’s latest TouchWiz Nature UX experience. When it comes to performance, everything seems to be running perfectly fine with this – though, its processor isn’t the most cutting edge thing out there right now. Regardless of its outdated status for a flagship device, the quad-core 1.5GHz Qualcomm Snapdragon S4 Pro processor with 2GB of RAM handles all the same tasks as its newer processor packing rivals. Honestly, there’s not much to complain here with the Sony Xperia Z. It has everything you’d like from a flagship device! From its premium design to its water resistant nature, this handset can easily stand toe-to-toe with some of the heavy hitters in the industry. For those of you curious about picking this one up, it’ll be available through T-Mobile’s stores and online starting on July 17th with a down payment of $100 – and $20 per month for the next 24 months thereafter. The corners are too sharp and make it uncomfortable to hold, the screen has terrible viewing angles and little contrast, and Samsung did a much better job with the software for the Exmor RS sensor than Sony did. Overall, I wouldn't recommend it for anyone other than someone who is very clumsy and/or goes outdoors a lot, but even then I would suggest something else first. Galaxy S4 Active comes to mind but is only for AT&T. And as for the viewing angles, they've gotten better after the update but the blacks appear dark greyish still... Super AMOLED is the way to go. Is there any difference from the original model? Enjoy the Xperia z ppl on tmobile! Wish att had first so I left since they never pick it up. i can only see phonearena watermark. Yes, isn't the answer to that obvious? Why would T-Mobile release a flagship phone for their own network that isn't optimized to all of their cellular networks?